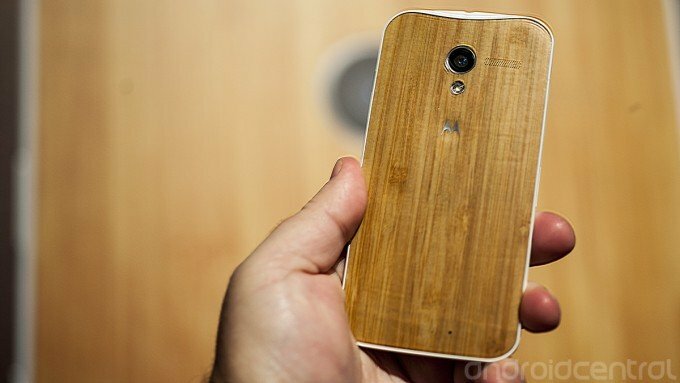 Motorola said we wouldn't have to wait much longer for Moto X wooden backs, and today Moto Maker has just added a new "bamboo" option. A new category of materials called "Natural" is listed above the other plastic color options, and are listed as online exclusives. Currently the only option available is bamboo, which also adds $100 to the price of your Moto X, as well as a delayed shipping time. After choosing the wood back you'll be stuck with white edges, but you still have all of the other color options for the front and accents on the phone — you'll also still be able to inscribe the back with your own message. The main Moto Maker page indicates that you're looking at a 14 day delivery time once you add a wooden back to your phone, but as we go through the order process we're being given an estimated delivery date of January 6th.